The big issue for traumatized people is that they don’t own themselves anymore. Any loud sound, anybody insulting them, hurting them, saying bad things, can hijack them away from themselves. And so what we have learned is that what makes you resilient to trauma is to own yourself fully. In the course of thinking about Rubenfeld Synergy Method in the context of trauma, I’ve been looking at the marvelous Bessel van der Kolk, known by many in the area as the head of the Trauma Center at the Justice Resource Institute in Brookline, MA. Krista Tippett interviewed him for On Being late last year, and the result is a remarkable look into the man’s life, work, and personality. He has been working with trauma since his time with Vietnam veterans at a VA hospital during his training as a psychiatrist. It was there that he first became fascinated with the idea what trauma is and what it does for us: a soldier refused to take the drugs prescribed for nightmares, because to him, the nightmares were a way of keeping the memory of his friends alive. I have seen this phenomenon in my practice, where clients often cannot feel what is happening in their bodies, or are unaware of what their bodies are doing, or they “leave the room,” in essence, dissociating whenever their awareness is called to their bodies. The experiences that they have had there are too intense to be repeatedly endured, and they have found ways to disconnect from their somatic experience. And so the process of addressing trauma somatically starts with helping people reconnect with their bodies in ways that can begin to feel safe. van der Kolk has worked with yoga, eye movement therapy, and other somatic practices to help people return to their bodies. “It was very striking in our yoga study,” he says, “even during the most blissful part of the yoga practice called Shavasana, what a hard time traumatized people had at that moment to just feel relaxed and safe and feel totally enveloped with goodness, how the sense of goodness and safety disappears out of your body basically.” In his work, as in Rubenfeld Synergy, van der Kolk has found that “something that engages your body in a very mindful and purposeful way — with a lot of attention to breathing in particular — resets some critical brain areas that get very disturbed by trauma.” It can take a while to help someone reconnect with their own breath, to have a sense of their skin and bones and muscles, to have a relationship to their own sensations and emotions that is not simply another way of triggering the trauma. But the research is clearer and clearer that returning people to their bodies is a clear route out of the cycle. “The stress hormones are good for you. You secrete stress hormones in order to give you the energy to cope under extreme situations…What goes wrong is, if you’re kept from using your stress hormones, if somebody ties you down, if somebody holds you down, if somebody keeps you imprisoned, the stress hormones keep going up, but you cannot discharge it with action. Then the stress hormones really start wreaking havoc with your own internal system. This links back to a post I wrote years ago that continues to be popular, about trauma and streaming. When action is possible in a moment of crisis, it is less likely to become “stuck.” But when trauma is repeated, or when movement or action isn’t safe, then the event or events can become “frozen” in the body, stuck in a repeat loop until we can return a sense of safety to the body, and a sense of consciousness to the ongoing experience of being embodied. Except for a small number of practitioners, the connection between trauma and the body is a minority voice in psychology. Luckily, it is expanding, but it has taken some time. I am hoping to connect with Dr. van der Kolk and the Trauma Center soon to talk about how Rubenfeld Synergy can contribute to this process of healing from trauma. For now, I recommend listening to the whole interview here , or reading the transcript here. 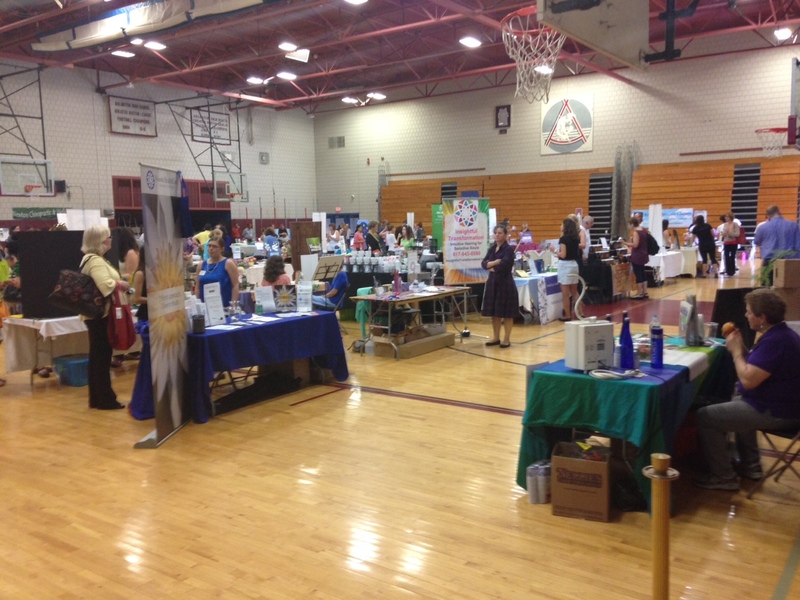 Yesterday I had the opportunity to go to an exhibition of dozens of workshop presenters and vendors on more holistic approaches to health at the Natural Awakenings Mind-Body Event. Amid some things that admittedly felt quite woo-woo, I found some really great practitioners and doctors doing work in ways that align with what I’m seeing in my own work, and the day was well-attended, enthusiastic, and inspiring. The show floor was filled with healers of all kinds, vendors of healthy foods, people giving demonstrations and hands-on work. The highlight for me, though, was the workshops, and I got to attend three and meet some great people. First for me was a crash course in Biofeedback, with Kim Larsson at Boston Behavioral Medicine. I hadn’t been familiar with what biofeedback was before, and its principles are very cool. Essentially, they take readings from people of their heart rate, muscle tension, breathing, skin conductivity (sweat and gooseflesh response), heart rate variability, surface skin temperature, and other markers that are known to respond when the body is in a state of stress or relaxation. Through getting immediate, externalized feedback of how your body responds to stress by seeing the readouts on the screen, biofeedback practitioners then train patients to self-regulate their own stress responses, thereby keeping their bodies at a healthier baseline in a conscious way and learning how to consciously relax. What I noted about it most is how much it aligns with Rubenfeld Synergy’s strategy of teaching increased somatic awareness, and how that awareness is the first step to opening up possibilities for change. I liked the idea of actually being able to see what is happening, and develop a concrete sense of agency over your own body’s responses to stress, anxiety, and trauma triggers. The other talk I really enjoyed was by Barbara Gosselin, a physical therapist who does cranio-sacral therapy. She spoke about the importance of working with the body with trauma. Her profound interest in and expertise in the body, including the much-overlooked fascial system, overcame any skepticism I had about CST, and it became clear that she, too, is doing work very closely aligned with RSM: gentle, listening touch, waiting for subtle change and release, and noting that with trauma, sometimes you don’t need the whole story – you just need to help the body return to a more relaxed, parasympathetic response to stimuli rather than the hyper-response that often gets stuck in the body in people who have experienced trauma. I’m looking forward to being in touch with both practitioners, and making more connections across the Boston area with people who are doing grounded, effective mind/body work. If you want to know how to increase relaxation, diminish stress, and heal from trauma, I hope you’ll contact me.